oestek replied the topic: 1967 GTO: A saga for the ages. This is a great saga indeed, Q! I'm really diggin' the story. You must have been completely stoked to hear that your Dad was finally willing to toss you the keys to the GTO. I'm also digging the old pics you've shared. I'm a huge history fan, and these cars all have such great stories. The car had a really good stance in the pics after you first got it home on that snowy day. Looks ready to brawl. I've always liked the '66-'67 GTOs, and I think the vinyl top helps bring the size into proportion. I'm looking forward to the next chapter! Qball replied the topic: Re:1967 GTO: A saga for the ages. That you! I'm enjoying writing it. I liked the stance back then, too. It had air shocks in the back and I would use them to adjust ride height. They finally had enough and blew out. I have KYBs all around, now. I'd love to either get coil overs all around or bag it. I have to explore the pros and cons of each. I'd love to hear your opinion on that. I'm a fan of the vinyl top, too. Just wish it didn't trap moisture. Last Edit: 22 Jul 2016 12:27 by Qball. Okay, At this point, I have the exhaust, and the front suspension replaced, been on a few Power Tour legs in 2010 and 2012. The car is running pretty decently. Not perfect, but decent. I take it to as many cruise nights as I can. Go to as many shows as I can. Pretty happy with the old goat. But, I can’t leave well enough alone. I decided that I want to have a tachometer. I don’t want it strapped to the steering column, I want it as part of the gauge cluster but I’m not going to spring for a rally gauge cluster with accompanying dash harness. I’m way too cheap for that. 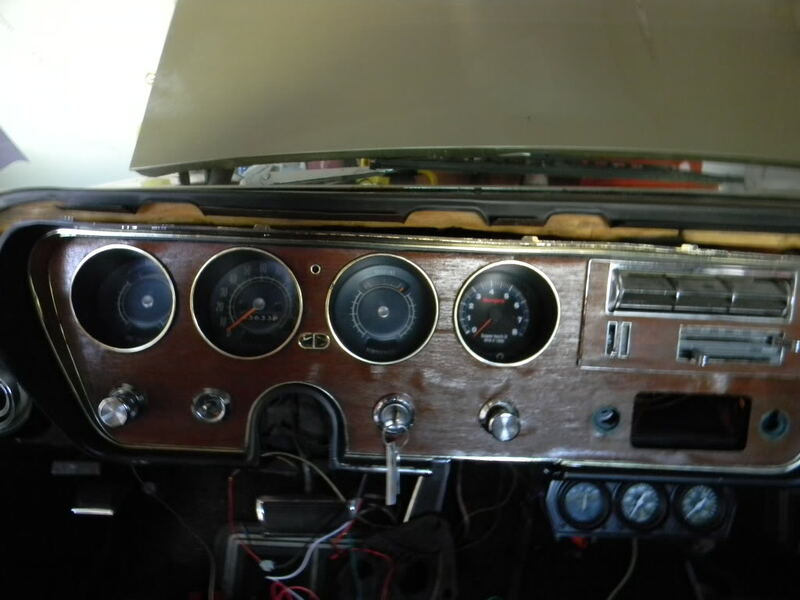 I’ve seen some people mount an aftermarket tach down the clock hole of the panel. That’s a step in the right direction but the bezel of the tach sticks out and just doesn’t look right to me. I had an aftermarket Sun Tach laying around and I decided to see if I could remove the bezel and have the tach still be usable. I was in luck as I was able to pop it off and have a flat face on the tach. Now, hare is where things get a bit dicey. I removed the entire instrument panel which scared the hell out of me as I was certain I would break something irreplaceable and the goat would never run again. Luckily my fears were unfounded. It took some time but I finally got it removed fully intact. I removed the clock bucket and removed the clock guts and then I had to cut out the rear of the clock bucket so it held the tach in place. IT was sandwiched between the clock bucket and the lens. Personally I think it’s a much more elegant, although much more involved, solution to to mounting an aftermarket tach. One of the things that bothered me about the goat is that it liked to backfire through the carb when under load. It was happening since before It came into my possession. I lived with it as it wasn’t too terrible. But like all things GTO, this, too, changed for the worse. I had been driving my older daughter to her soccer practice and other events throughout the summer of 2014. I would take it to various errands around town. Things were great, until they weren’t. The backfiring was getting progressively worse. It was rendering the goat miserable to drive. I parked it and started my investigation. I pulled the valve cover and, on the driver side, had a pretty sloppy #5 exhaust rocker arm. The rocker arm retainer nut wasn’t backed off and a Pontiac valve train isn’t adjustable. The pushrod wasn’t bent. That left one really glaring option. A wiped out cam lobe. A bit more disassembly confirmed my suspicions. Power Tour season was coming and I wanted to participate again. I wasn’t really in a position to get a full blown rebuild done on the engine. I’ve heard of people doing an engine in car cam swap and decided that was my most economical route. I started taking things apart. It was a pretty straightforward job. The one thing that was a bit dicey was the AC condenser. I didn’t want to open the system and remove it. Luckily I was able to detach it and was able to sort of twist it out of the way of the cam but juuuust barely. I decided as long as I was swapping the cam, why not try to upgrade a bit. 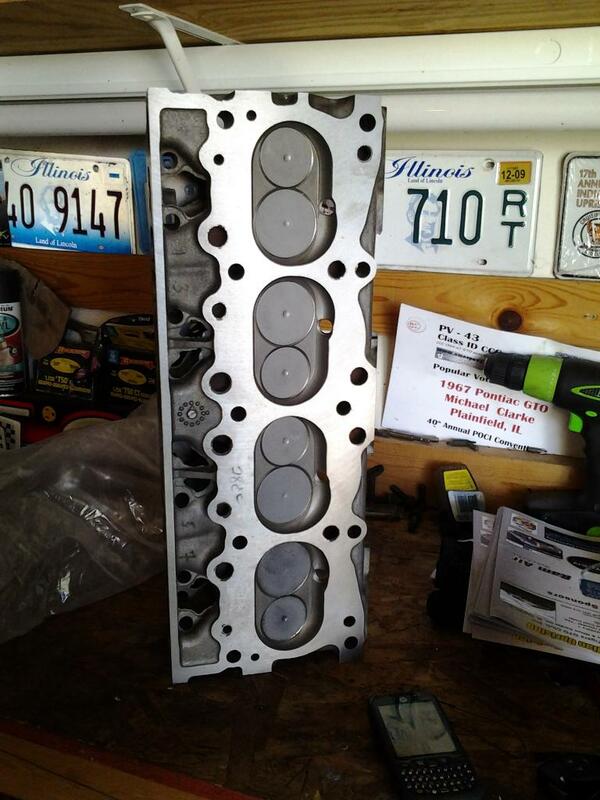 I picked up a Melling SPC-8 cam which is the Pontiac HO or 068 cam and a set of matching valve springs. I picked up a set of Hylift Johnson flat tappet hydraulic lifters as the word on the street is that they are the best quality flat tappet lifter you can buy. A buddy of mine threw me a set of BBC adjustable rocker studs. So, I have everything I need to complete the swap and started re-assembly. Things were going well. A little too well. 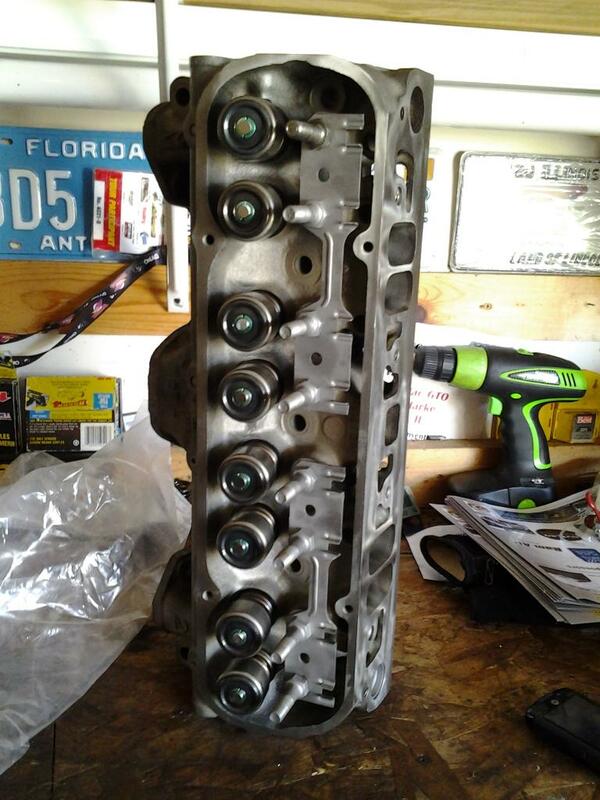 I left the heads on for the swap. My Buddy, Randy, came by with a tool to put compressed air in the cylinder to prevent the valve from dropping in the cylinder when we removed the valve springs. All was well until we got to #5. There was air escaping from the exhaust valve. It was at that point that my Power Tour dreams were officially dashed. I pulled the heads and Randy and I pulled that valve out and sure enough there was a boogered up valve seat. There was some side play in the valve guide, as well. 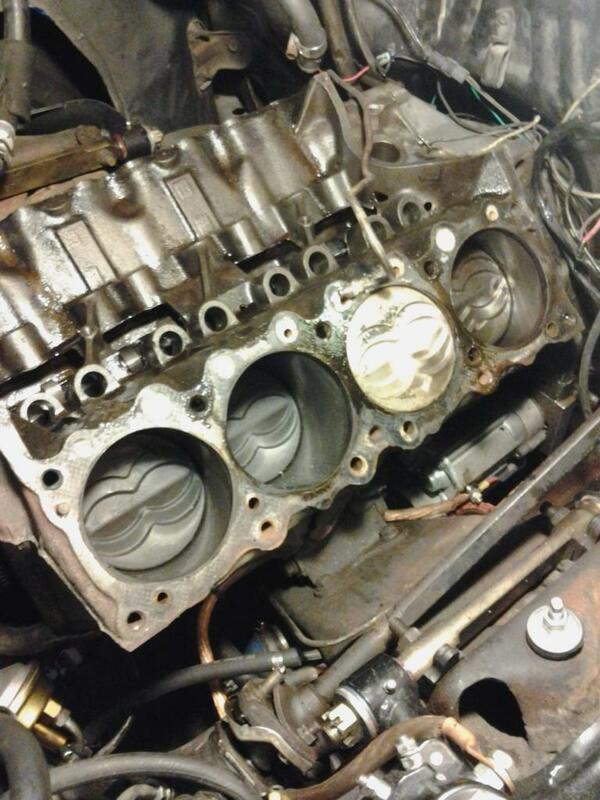 To top it off,removing the heads, of course, exposed the pistons. To my chagrin, I was looking at a set of cheap, cast rebuilder type pistons that were used quite a bit 20 years ago. They are designed to be compatible for a 389 and a 400. Those two engines use slightly different valve angles which the pistons accommodate by having 8 valve reliefs built in to the piston head. This gives you quite a bit of chamber volume which significantly reduces compression ratio. Not a good combination for a cam that’s designed to to be used with a 10:1+ compression ratio which is what the 068 cam wants. So, looks like I’m looking at a head to toe engine rebuild. Great. I felt like I was swinging in the breeze. I'm super paranoid about other people doing work for me as I’ve heard too many machinist horror stories. Randy turned me on to the guy he uses. You have to know that Randy had very high expectations when it comes to most things, machine work included. This machinist works by word of mouth only. You have to know a guy in order to have this guy do work for you. Randy called him up for me and got me ‘approved’. I took my completely disassembled heads to him along with the valves. Upon arrival, with Randy, he took one of my valves, cleaned the face up, checked the stem diameter for taper. He came back about 5 minutes later and said that my valves were fine and that there’s no need to buy valves. I immediately knew I was in good hands. I left my heads with him and said I wasn’t in a rush. Randy said to me after we left, “Dude! You NEVER say that to a machinist. He’ll have those heads forever!” Ooooh, I never thought of that. But, to my surprise, 1 week later he called me to tell me that my heads were all done. I went to pick them up. I need to tell you that this guy likes to talk. I got to his shop and 4 hours later I left with my heads. Yes, 4 hours. I didn’t mind too much as his shop is really cool. He builds some really high end racing engines and some really sweet vintage stuff. At this point, my heads are home and looking great. I still have a short block to deal with. Unfortunately, funds didn’t allow me to move forward. So there it sat. After a while, Randy offered to help me get the short block out of the car. He brought his engine hoist and engine stand over to my place. It came out in no time. We had it mounted on the engine stand and began tearing it apart. Turns out, me wanting to do an engine in car cam swap was more of me burying my head in the sand at the bigger issue. That would be the damage done to the rotating assembly due to metal shavings from the cam flowing through the engine. This became abundantly clear as I began removing the main and rod caps. Every bearing surface was deeply scored down to the copper. The crank journals didn’t look too hot either. 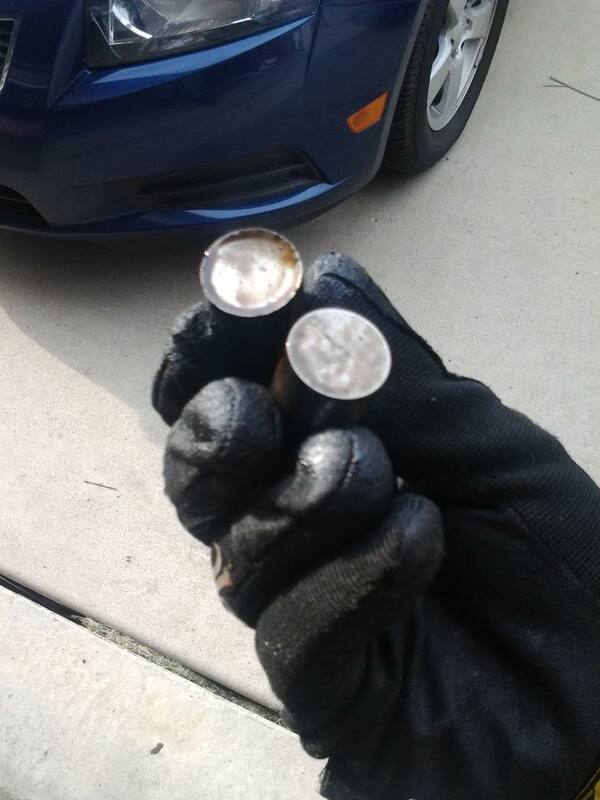 Also, there was some deep corrosion in one of the cylinders. I wasn’t sure if that cylinder would have to be sleeved. With the luck I’ve been having, it would have to be sleeved twice! Now that the engine is apart, I needed to have a plan for it. Because this is an factory AC car and I want to retain it, I need to have an engine that has good low to mid range torque. Luckily, this is what pontiacs are known for. I decided that 400 cubic inches wasn’t going to cut it, though. I’ve heard a lot of good things about stroker kits and wanted in on the action. Also, I want the bottom end to be virtually bullet proof. While I’m sure a cast crank would suffice, I made the choice to go with a forged crank, rods, and pistons. This should let me really open things up from time to time without worry. That leaves me with one more critical choice. The cam. Originally I was going to go ahead with the 068 cam I already have. My research told me that it would be more than fine with an engine of the displacement a stroker crank would give me, 461 CID. At this point, I’m pretty confident with the decisions I’ve made. Yes, very confident, that is until doubt started creeping in. I’m talking about my cam choice. More specifically, flat tappet -vs- roller. Having experienced the aftermath of a wiped cam lobe, I want to take every precaution to prevent another occurrence. Regardless of the amount of precautions taken, the quality of materials used, I’ll always have it in the back of my mind the possibility of this happening again and that would make it nearly impossible for me to enjoy the car again. That made the decision to go with a roller cam an easy one. I finally got my act together and got my block to my machinist. It was nearly 2 years from when the heads were done until I got the block to him. We talked at length about what my goals are and he was on board with everything. I left him the bare block as pretty much everything internally would be replaced. He contacted me a week or so later to tell me that the block was in real good shape. The corrosion in the cylinder I mentioned earlier was taken care of with a .005 overbore. It was .030 over as delivered. So the .005 overbore puts me at a bore size of 4.155” and a stroke of 4.25”. My machinist is ordering all the parts. The pistons have to be special ordered as they need to have a 21cc dish in order to get the compression ratio in line. The heads are cc-ing at 78ccs. That brings us to present day. The block is at the machinist and he’s doing his thing. It’s been there for about 6 weeks. I’m going to call soon to get a progress report. As things progress, I’ll update the saga! Sorry for taking so long to post on the GTO story, but things have been really busy around here. This is a cool story and I enjoy reading it and seeing your progress! 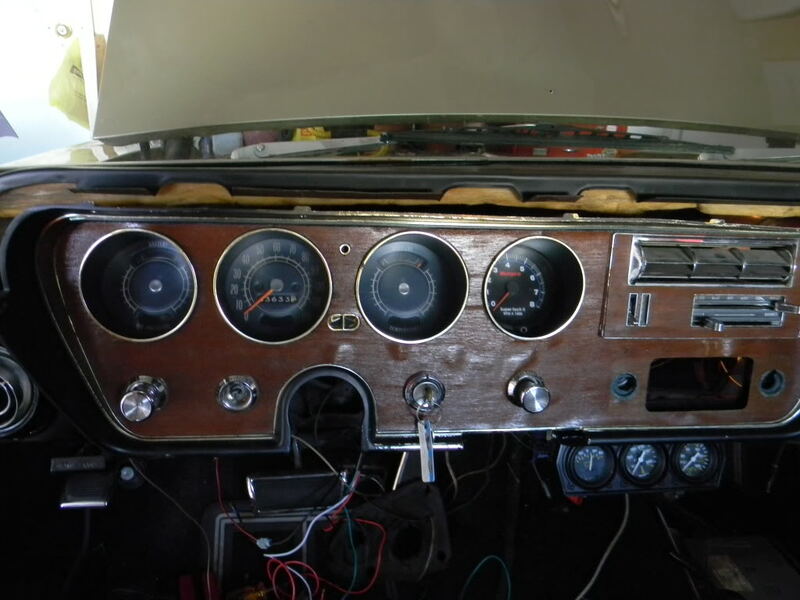 Nice work on the in-dash tach, I agree, it looks pretty slick that way. 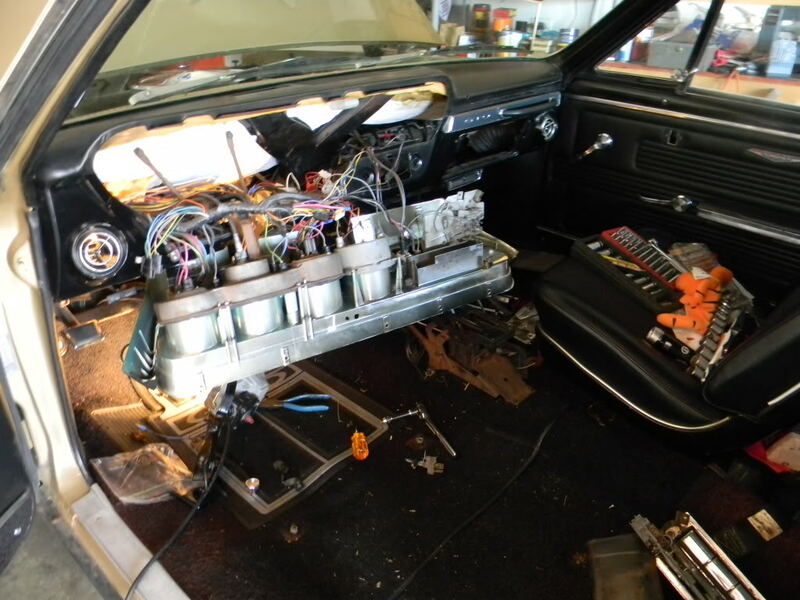 Those GTO dash clusters can be pretty daunting, glad to see it all went back together smoothly. I dig those 8-relief pistons! Those are darn-near universal... they probably fit different bores as well! It would be interesting to measure those and see how much the second set of reliefs were costing in compression, in addition to quench and swirl. Maybe not interesting enough to actually DO it, but it would be cool to see. The new roller stroker will be a really nice engine, something I would imagine Pontiac would have done back in the day if the technology was available. They were the tech leaders, after all. Wasn't the Ram Air IV cam the first computer-designed cam ever? Looking forward to the next update, but I realize it's now real-time, so I'll be patient! So, I have a bit of a non update, update. I decided to drop by my machinist's shop just to see what's up. We chatted a bit and I asked him if my pistons have come in. He had a blank look on his face for a second while he thought about it, then said "Yes!" We chatted a bit more. Then took a look at these sweet pistons. They looked beautiful. Except they were wrong. ARRRGH! They were supposed to be dished to -18cc. These were at -7cc. For some reason he thought that these were, in fact, correct. He cited the compression height of the piston vs what he calculated. These will sit in the hole a little deeper, effectively reducing compression ratio to a usable level. He's going to re-measure the block and verify everything. If it ends up being that the pistons are not correct, he says he has access to a cnc machine to create the necessary dish. oestek replied the topic: Re:1967 GTO: A saga for the ages. Qball wrote: So, I have a bit of a non update, update. I decided to drop by my machinist's shop just to see what's up. We chatted a bit and I asked him if my pistons have come in. He had a blank look on his face for a second while he thought about it, then said "Yes!" Hopefully he can cut 'em down the way they need to be. It's usually easier to make piston dishes bigger than smaller! Thanks for the update!